Pioneers in the industry, we offer loading conveyor, gravity ball conveyor, gravity skatewheel conveyor, rubber belt conveyor, plastic modular belt conveyor and chain conveyor from India. For the diverse requirements of our valued clients, we are involved in manufacturing, exporting and supplying an extensive range of Loading Conveyor. Widely used in several industries for raw material unloading and finished goods, our offered loading conveyor is designed by our workforce using latest technology as per the set industry norms. 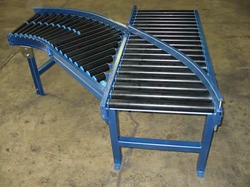 This loading conveyor is available from us at market rates. We feel proud to introduce ourselves as the leading manufacturer, exporter and supplier of Gravity Ball Conveyor. 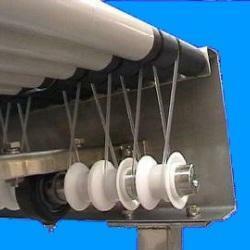 Our offered ball conveyor is provided in several stipulations to choose from. This ball conveyor is designed using top class components and modern technology under the direction of our skilled personnel. Offered ball conveyor is checked on well-defined parameters in order to offer defect range at the clients' end. We are the prominent manufacturer, exporter and supplier of a wide range of Gravity Skate wheel Conveyor that can also be positioned where multiple lines meet, this conveyor is manufactured by utilizing the optimum quality raw material and leading technology. Offered conveyor is available from us in numerous stipulations to choose from. From our wide range of products, we offer optimum quality Rubber Belt Conveyor. Our offered conveyors are designed using high grade steel skate wheels mounted on axles and leading technology in adherence with market norms. 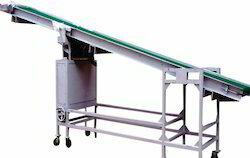 Our customers can avail these conveyors from us in various customized options. 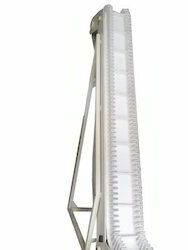 Also, we offer our entire range of conveyors in different specifications. Eminence manufactures Plastic Modular Belt Conveyor innovative high performance and energy efficient modular plastic belt conveyor systems. Our low cost conveyor design combines direct drive motors and proprietary ultra-low friction plastic chain belting in a lightweight modular aluminum sectioned frame.The modular conveyor belting simplifies construction and allows us to build any size belt with the same components. The conveyor belt has a smooth surface that improves corner turning while reducing scuffing when sliding under items. 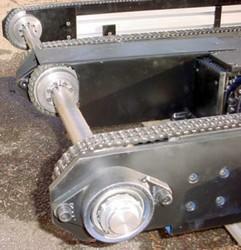 Chain conveyor offer robust transport for pallets and flat products. Positive drive facilitates high loads on the chains. 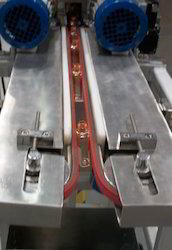 This chain conveyor has 2 lanes working together on an application for large pallet transport. 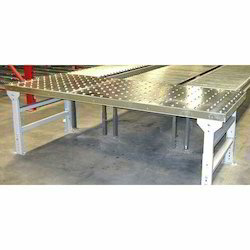 This version has the metal heavy duty accumulating chain and the raised edges on the wear strips to guide the pallets can just about be seen.The main structure is made of stainless steel or aluminium profile. The stainless steel or engineering plastic flat top chains are optional for chain scrappers from the working face. It is widely used in production lines for drink, beer, food, pharmaceutical, printing, cosmetic and electronic industries. Accumulation Conveyor are used for easy and fast feeding of bottles or other similar containers to a filling, labeling or other line. Accumulation Conveyor act as a buffer at the end of a line to enable bottles or similar containers to easily be handpicked for case packing for instance. Close the gaps during accumulation mode, therefore allowing increased storage onto the conveyor. Advanced designs accumulate with diverters at the infeed to send onto the alpine and when unloading, providing merge systems the ability to handle a wide variety of product. The purpose of our Side Grip Conveyor is to provide a conveyor line a place to clear out down or broken product and loose debris from the conveyor chain. 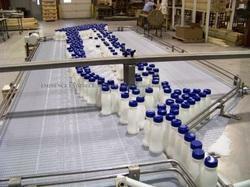 A common application is to use the over-the-end transfer on a glass line downstream of a bottle squeezer. Good bottles pass through the squeezer and are carried across the gap, while defective bottles shatter and the broken glass goes over the end of the conveyor and into cullet conveyor for recycling. The Side Grip Over-the-End Transfer features the same on-the-fly adjustment featured on our other Side Grip units to allow for different product widths. We will build the unit with as wide a gap as you want between the infeed and discharge conveyors, allowing us to accommodate a wide range of product heights. 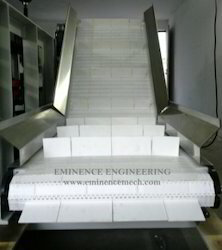 Eminence make lowerators and elevators are designed with a heavy duty construction. The standard automatic chain lubrication system ensures maximum wear track and chain life. Other standard equipment includes an auto-pneumatic take-up. Wire Mesh Conveyor and chain driven conveyor belts are used worldwide in industries such as heat treating, forging, foundry, food processing, snack food, baking, ceramics, glass, automotive and more. 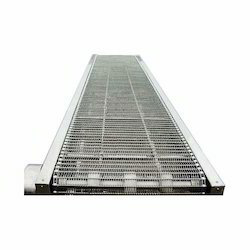 Eminence make Wire Mesh Conveyor is tight wire mesh for flexibility and conveying small parts, special smooth surface belts for easy accurate transfer, wire belts with large openings for easy flow of air or water and for simplified cleaning of your product. Conveyor Belts are widely used in forging, food processing, dairy, bottling plant, engineering industries, oil drops, oil spray, cooling, heat treatment, baking etc. We produce wire conveyor belts as per customer specifications. Eminence make Turn Table with Stainless Steel Tubular construction. Foot pads are fully articulating and vibration resistant. Base cabinet is offered either open frame or fully enclosed stainless steel with gasketed, hinged access door and compression latches. Unique floating bearing removes downward thrust on drive armature to ensure long life. 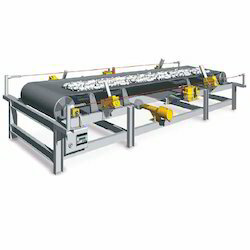 Telescopic Conveyor is the perfect labor-saving component to meet the demands of high-speed production lines in a wide range of industries for raw material unloading and finished goods loading in the carriage.Telescopic Conveyor is deluxe product for Loading/Unloading application with all necessary safety standards. Telescopic Conveyorhas heavy-duty design and durable construction requires minimal maintenance, thus assuring many years of dependable operation.Machine is having a very robust and vibration free body constructed on steel frame. It can also made with all food grade standards. User friendly and variable speed controls for conveyor speed make the operation easy to adjust as per output. Only one employee is required to operate the Telescopic Conveyor. Gravity Roller Conveyor used when Items with irregular surfaces, such as drums or older cartons and boxes, or items too loosely bagged to transport well on gravity wheel conveyors, can all be transported on the gravity roller conveyor. Gravity roller conveyors use the same principles as wheel conveyor, but have some added advantages. They are available in light to medium duty construction and can therefore handle a wider variety of loads and be used in more robust applications. In addition to our standard product line, Eminence can provide custom modifications to meet specific customer needs. As an example, companies often will utilize aluminum construction gravity conveyor for applications that require frequent assembly, disassembly or relocation due to its light weight as compared with similar conveyor of steel construction. Eminence specializes in the designing and manufacturing of material handling solutions. These conveyor systems have the ability to accumulate, flip, stack, rotate, push, divert, or index your products between manufacturing or packaging process. 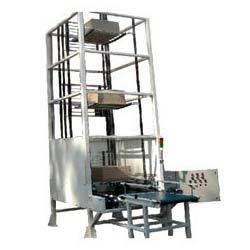 Drive Roller conveyor is suitable for all types of cartons, bags, salvers cargoes’ conveying. It can transport single heavy thing, or can bear more impact load. It has big throughput, high speed, light operation, and let multispecies of shunt delivery from collineation come true. Drive Roller Conveyort can be used in complex logistics conveying system which consists of multiple roller conveyors and other conveyors to reach various craft needs and accumulated conveying of material. Roller conveyor has simple structure, high reliability, and simple maintenance. Vertical Conveyor is compact, simple and reliable, allowing companies to maximize their production efficiency without sacrifices.